The Hottest Film Destination Now Has a Worthy Studio! Workshops Stages Bring your next production to Big Easy Studios in New Orleans. We provide a complete range of Professional Studio Services. Completely Secure, Plenty of Power, Unlimited Parking Louisiana has a proven tax incentive, a great crew base with plenty of resources to support your project. The private sector will make you feel welcome and your cast and crew will always have a place to go as this is a city that never sleeps. 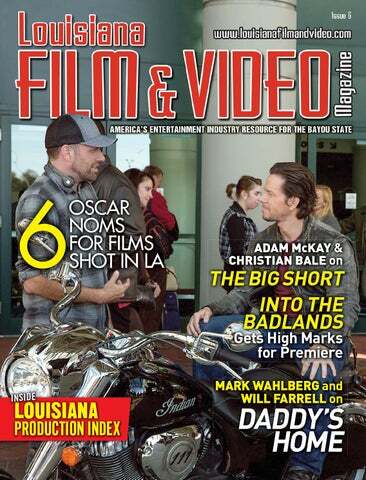 49 A Step Into the Badlands with Actor Lance Nichols ON THE COVER: (L-R) On location, director Sean Anders discusses a scene with actor Mark Wahlberg on the set in front of the Morial Convention Center in New Orleans for Daddy’s Home from Paramount Pictures. Display Advertising: Call Media Index Publishing Group for a current rate card. Discounts for frequency advertising. All submitted materials become the property of Media Index Publishing Group and will not be returned. Subscriptions, call (800) 332-1736 for information and rates. Copyright ©2016 Media Index Publishing Group. All Rights Reserved. No part of this publication may be used for solicitation or copied by any means, electronic or mechanical, including photocopying or recording by any information storage or retrieval system, without the express written permission of the publisher. DARK, SATIRICAL, EDUCATIONAL COMEDY Actors discuss the possibilities of failed mortgages in The Big Short. Steve Carrell (hand raised) is on a crusade to learn the truth in The Big Short. (L-R) Director Adam McKay and actors Steve Carrell, Hamish Linklater, Billy Magnussen, and Rafe Spall on the set of The Big Short. Actors Finn Wittrock as Jamie Shipley and John Magaro as Charlie Geller. Academy award nominee Christian Bale learned to play the drums for his role. (L-R) Director Adam McKay and Steve Carrell discuss a scene after playback. The 143 room boutique hotel mirrors the culture of fun and genuine individualist of one of American’s most fascinating destinations. Located on the edge of the Central Business District just a block from the rocking French Quarter and Canal Street, the Royal St. Charles Hotel is a perfect headquarters for your exploration of New Orleans. The hotel’s name honors two of New Orleans’ most historic thoroughfares in Royal Street and St. Charles Avenue. The music of Bourbon Street is a short stroll away, and just outside the hotel entrance is the St. Charles Streetcar Line which takes you uptown to the Garden District. Royal Street turns into St. Charles Avenue once crossing over the major thoroughfare of Canal Street. Royal Street is one of the oldest streets in the city of New Orleans, which dates back to the French Colonial era. Renowned for antique shops, art galleries, and stately hotels that line its sides as it runs through New Orleans’ French Quarter and tourist district, Royal Street is the most identiﬁed street in the French Quarter besides Bourbon Street. (L-R) Academy award nominees actor Christian Bale and director Adam McKay discuss a scene on the set of The Big Short. Christian Bale had few scenes with other actors. INTRODUCING Your on-site 767 Mock-up delivered to your ﬁlming location INOVOJET’S TRANSPORTABLE 110-FT LONG FILM/TV 767 PLANE SET Or shoot in our 25,000 sq. ft. studio and production can beneﬁt from both the Louisiana Tax Credit up to 40% and the local Jeﬀerson Parish 3% Tax Credit. 471-718-3200 cell * 417-426-5036 ofﬁce hillbillyautotransport.com Let us take the worry of your period cars off your mind. We know how to start them, haul them, keep them running and know the brake issues many of them have. he following legislation made signiﬁcant changes to the motion picture investor tax credit program: Acts 129, 134, 141, 142, 143, 144, 361, 412, 417, 425, 451 & 452. This overview summarizes the changes, for informational purposes and general guidance, but is subject to the actual language of these enactments, and to further requirements as may be provided by the Louisiana Department of Revenue (LDR) through Revenue Information Bulletins (RIB) as well as rules promulgated under the Administrative Procedures Act. Get up to 30% back on your production expenditures in Lousisiana and an additional 10% on your Lousiana resident labor! The Shreveport-Bossier Film office has a reputation for making production easy, with full city government support and streamlined paperwork and permit processing. try of Motion Picture Tax Credit Brokers, which shall be found at www.revenue.la.gov/brokerregistry. Penalties If a Seller or Broker sells any Tax Credits prior to qualifying for and being included in the public registry, the transfer has no legal effect and is deemed ineligible for registry in the Louisiana Tax Credit Registry. 3 In addition, the Seller or Broker faces the following possible penalties: a ﬁne of up to $10,000, prison for up to 5 years, or both. If convicted, the Seller or Broker will also owe full restitution for any ﬁnancial loss resulting from his or her failure to register. LDR estimates that there are less than 20 brokers currently selling Tax Credits in Louisiana. Therefore, starting in January of 2016, taxpayers seeking to purchase Tax Credits should consult this registry to ensure that their Seller or Broker is compliant and has properly registered. LFV Meg Alsfeld Kaul is a ﬁlm and entertainment attorney with the Louisiana law ﬁrm of Kean Miller LLP. Kean Miller LLP provides this article as a public service for general information only. The material contained herein may not reﬂect the most current legal developments. Such material does not constitute legal advice, and no person should act or refrain from acting on the basis of any information contained in this article without seeking appropriate legal or other professional advice on that person’s particular circumstances. Kean Miller and the authors expressly disclaim all liability to any person with respect to the contents of this article, and with respect to any act or failure to act made in reliance on any material contained herein. 1. See La. R.S. 47:6007(C)(7)(a)(i)(aa)-(cc). 2. See La. R.S. 15:587(A)(1)(h). 3. See La. R.S. 47:1524.
entral Casting, the national leading provider of background actor casting since 1925, celebrated 90 years of service to the entertainment industry on December 4. The Louisiana office recently held a Talent Appreciation Lunch to celebrate the event. s you drive into John Schneider Studios, you can’t help but notice the wrought iron gate with “JSS” inside the Superman crest. It’s a ﬁtting symbol for a man who is determined to make his mark on the world of independent ﬁlm. At ﬁrst glance, his compound looks like the idyllic location his character Bo Duke would have retired to if he had won the lottery. Located just north of New Orleans, the 58 acre wooded retreat is a ﬁlmmaker’s dream-cometrue with two soundstages and lots of rustic locations including a bait shack and a ﬁshing pier. John Schneider with his dogs (L-R) Gravy and Stormy. On location at John Schneider Studios’ 58 acre backlot. very year thousands of buyers, sellers and creators of independent ﬁlm gather in Santa Monica for American Film Market (AFM), the largest international sales market for ﬁlm in North America. AFM is organized by the Independent Film & Television Alliance (IFTA) which is the global trade association for the independent motion picture and television industry representing more than 150 member companies from 23 countries, consisting of independent production and distribution companies, sales agents, television companies and ﬁnancial institutions engaged in ﬁlm ﬁnance. The market is always a barometer for trends in the independent production, ﬁnance and distribution. This year’s AFM saw more than 1,600 buyers representing over 70 countries. This included more than 80 new buying companies with the largest growth coming from South Korea, China, Germany and India. AFM Conference Session on Finance, Production, & Distribution in China: with both English and Chinese being spoken, interpreter services were offered to attendees for this session. Foreign sales have still not fully recovered from the DVD/home entertainment market crash ten years ago, but at least there were sales. While there was still much interest in U.S. soft money such as state tax incentives, credits and rebates, those at market seemed focused on networking and trying to ﬁnd Chinese producing partners. For producers looking at making one independent ﬁlm or ﬁnancing an entire slate, the signiﬁcance of the increased production as well as the ever-expanding box ofﬁce in China cannot be ignored. Research and strategy are recommended to see how it will impact your company’s future projects. LFV AFM attendees network in the lobby of the Loews Hotel in Santa Monica. WE PROVIDE: Dogs, Cats, Horses: For Movies, Commercials & Live â&#x20AC;&#x153;Stage.â&#x20AC;? Hero car from Easy Does It. Portraits, Stills, Events, Architecture and Interiors. Commissions Welcomed. very November in Lafayette, Louisiana, Southern Screen Film Festival presents four days of ﬁlm screenings, panels, red carpet events, parties, and workshops. Southern Screen moves beyond the traditional ﬁlm festival and works to open up the community to the widespread possibilities of storytelling. The festival offers a hands-on experience where the creativity in ﬁlmmaking mixes with a landscape of the local Cajun and Creole culture to inspire and ignite the local community and visiting ﬁlmmakers. Southern Screen knows creating a good ﬁlm is worth celebrating, no matter how long or short it turns out to be. It should be seen on a large screen with an audience full of people and not streaming on a small laptop. Southern Screen believes in watching through to the end of the credits because the festival knows that it takes a lot of people to make it happen. The Festival is invested in the process of educating the community on how to appreciate cinema as well as give them the tools to create it on their own. With over 50 screenings and events, Southern Screen Film Festival began Thursday, November 19, at the Louisiana Immersive Technology Enterprise (LITE) with an opening night reception of raw Gulf oysters and champagne for guests. Following the reception was the Louisiana Premiere of Experimenter. Both events were well received with a large audience. See ad on page 44. S ad See d on page 44 44. See ad on page 41.
his year’s Background Actors Guild (BAG) Awards was held at NOLA Brewing Company. The annual event honors local background talent. A special award is also given to set catering since that’s one of the nice perks of hanging around on set when you’re background talent. 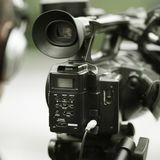 For over 14 years, Picture Cars of Louisiana has been the leader in providing camera YHKLFOHVWRWKHÀOP & video industry. IC Media Solutions’ next book, “Rock Bottom & Back,” will chronicle the experiences of 12 men and women who overcame seemingly insurmountable adversities to become successful in their business and personal lives. “Rock Bottom & Back” will also be adapted into a 30-minute ﬁlm segment that will be shopped to TV networks as a pilot for a poleft are Steven Scaffidi and David Bottner tential series. BIC Media Solutions From of The New Orleans Mission and Earl Heard of BIC Media Solutions. is teaming up with newly formed Mission Media Productions, the production arm of The New Orleans Mission, for the ﬁlm segment. Established in 1989, The New Orleans Mission is a private 501(C)(3) nonproﬁt organization providing services to the homeless population of New Orleans. Strickland, left, founder and former CEO “Rock Bottom & Back” will fea- Jerry of AltairStrickland, sits with his son, Whitney ture several individuals, including Strickland, during a ﬁlming segment for “Rock Bottom & Back.” The New Orleans Mission’s David Bottner, who serves as executive director for the organization. Other ﬁgures featured in “Rock Bottom & Back” include Gabriel Alvarado, a CITGO ﬁre chief who was burned in a reﬁnery ﬁre in 2009 and now speaks to workers about safety issues; Troy Duhon, a successful car dealership owner and philanthropist who endured severe damage to his Louisiana business in Hurricane Katrina and now shares the word of God through “God’s Not Dead” and “God’s Not Dead 2;” Jerry Strickland, founder and former CEO of AltairStrickland and author of the inspirational book “Turnarounds,” and his son, Whitney Strickland. Steven Scafﬁdi, director of development, marketing and media for The New Orleans Mission, has been in the production business for approximately 30 years. When he started working at The New Orleans Mission, his goal was to put together a media department where the organization would produce projects. “The story of ‘Rock Bottom & Back’ is a story of many at The New Orleans Mission,” said Scafﬁdi. “Our mission is to reach out to hurting and homeless people. When somebody ends up homeless, that person has hit rock bottom. Being at the mission and seeing these kinds of stories ﬁrsthand, we became very interested in partnering with BIC Media Solutions on ‘Rock Bottom & Back.’” BIC Media Solutions has retained Susan Mustafa, who co-wrote the New York Times-bestselling true crime thriller “The Most Dangerous Animal of All” with Gary L. Stewart, to write “Rock Bottom & Back.” BIC Media Solutions is also partnering with Mascot Books. To nominate an individual to be featured in “Rock Bottom & Back” or for more information about BIC Media Solutions, contact Earl Heard at earlheard@bicalliance.com or Rose Gladner at rose@bicalliance.com, or call (800) 460-4242.
f you’ve been to the theater lately to see a ﬁlm, chances are that the trailers, ads and promotional materials that you saw on TV or on social media persuaded you to go. And if that ﬁlm was faith-based or inspirational, Gray Media likely played a starring role as the key inﬂuencer. he LA Film Industry Christmas Party is always a fun event where cast and crew get to dress up in their holiday ﬁnest and party; however, the celebration has also served as an opportunity for the local ﬁlm industry to give back to the community over the last few years. Actor Drew Rin Varick (R) gets in on the elf action. Louisiana talent donated more than 200 toys. MIndy Van Kuren and Rebecca Rutherford Diaz help Bill Rainey spread holiday cheer at Children’s Hospital in New Orleans. (L-R) Mark Wahlberg and Will Ferrell in a scene ﬁlmed at Louis Armstrong International Airport in New Orleans. addy’s Home is a Louisiana homecoming for Mark Wahlberg and Will Ferrell. Wahlberg was last in town shooting Two Guns while Ferrell did Get Hard in New Orleans. Daddy’s Home is also an ode to New Orleans locations. While the Louis Armstrong International Airport and the Smoothie King Arena are hard not to miss, the non-stop action and laughs make other locations such as NORDC’s Gernon Brown Rec Center ﬂy by. The chemistry between actors Will Ferrell and Mark Wahlberg is largely responsible for drawing audiences in. And while the roles seem tailored to each actor, there was doubt early on regarding the casting. (L-R) Mark Wahlberg and Will Ferrell in a scene ﬁlmed at NORDC’s Gernon Brown Rec Center. Will Ferrell plays Brad, the dependable step dad. (L-R) Will Ferrell and Mark Wahlberg in a scene at the Aquarium of the Americas in New Orleans. A 0.6-mile walk from Eldorado Resort and Casino Shreveport, this modern hotel is a 1.2mile drive from the Louisiana Boardwalk Shopping Center. The bright rooms have free WiFi, TVs and desks, as well as mini fridges, microwaves and tea and coffee make equipment; some have river views. Suites add kitchenettes, sitting areas with pull-out sofas and fireplaces; plus whirlpool tubs. Children 17 and under stay free with a parent. Amenities include free parking and a country-style buffet breakfast, as well as an outdoor pool and a 24/7 fitness center. Thereâ&#x20AC;&#x2122;s an airy lobby with seating, a business center and laundry facilities. (L-R) Will Ferrell and Mark Wahlberg in Daddy’s Home. I am an aspiring stunt performer. I have a background in martial arts (speciﬁcally Sanshou or Chinese kickboxing), and some stunt courses under my belt. My specialty and passion would have to be screen ﬁghting though. I love the balletic movements yet frenetic energy of Hong Kong-style ﬁght choreography, the likes of which you are starting to see in ﬁlm today! It’s caught on like wildﬁre in the ﬁght ﬁlm industry. To make something so engaging and amazing to watch takes a lot of hard work, grit, sweat, and maybe even a few bruises. But it would be totally worth it! I would love to and will bring this type of energy and choreography to the ﬁlm ﬁght world, and would love to work alongside others that share this same passion. I am Sean Meteye, Stunt Guy. And this is my dream. t the Consumer Electronics Show (CES) in Las Vegas, Kodak kicked off its Super 8 Revival Initiative with a display of an early prototype of a new Kodak Super 8 camera that combines the classic features of a Super 8 with digital functionality. Kodak was also sure to highlight all the ﬁlmmakers who were rallying behind the Super 8 revival. One Super 8 ﬁlm cartridge can shoot 2 1/2 minutes @ 24 FPS. Kodak’s new Super 8 camera is a digital/ﬁlm hybrid. e all love recognition. SAG, PGA, DGA, ASC, ADG, ACE and other guilds’ awards go to great lengths to recognize talent; but all too often, forgotten is that incredible production assistant (PA) that remembered how the director liked his latte or the caterer who kept everyone happy and fed. At Oscar time, when our friends and family actually take an interest in our industry, it’s important to reﬂect how we, as cast and crew in Louisiana, have made a positive impact on our local industry.